Manxgirl living and crafting down under. : Shhh, it's oh so quiet! Because Loulee has a very sore throat. Tony had the end of last week off work with a sore throat and saw fit to share it with me! There is no way I could be polite and talk to customers all day, so I guess I'll have a couple of days off work too!! I guess that means I'll be able to continue with my latest project. The big tidy up last week yielded stitchy results. I set to and made a third start on a quilt for DS Joe. If you recall, quite some time ago he asked for a nautical quilt. I've had a couple of tries at it, but they failed. This time, I'm on my way. I found patterns for nautical signal flags, they are so quick and easy to make. I have nearly the whole alphabet done! Just W, X, Y and Z to go! 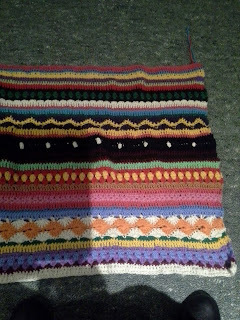 I'll need to make some extra blocks too, just to pad things out a bit, but I feel that at last I have made real progress and can see where this one is going. The overseer kept an eye on proceedings yesterday. 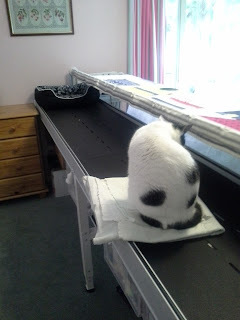 She has a perfectly cosy kitty bed there on the quilt frame, but chose to park her backside on my pressing mat. She was not happy when I shooed her off and took it over to the work table. I'm also still going with my crochet. My new project is far more colourful than these photos would have you believe. In fact, they look better here than they do in real life!! 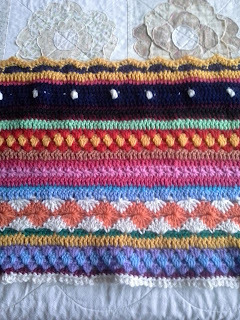 The pattern I'm following is the 'as we go stripey blanket'. 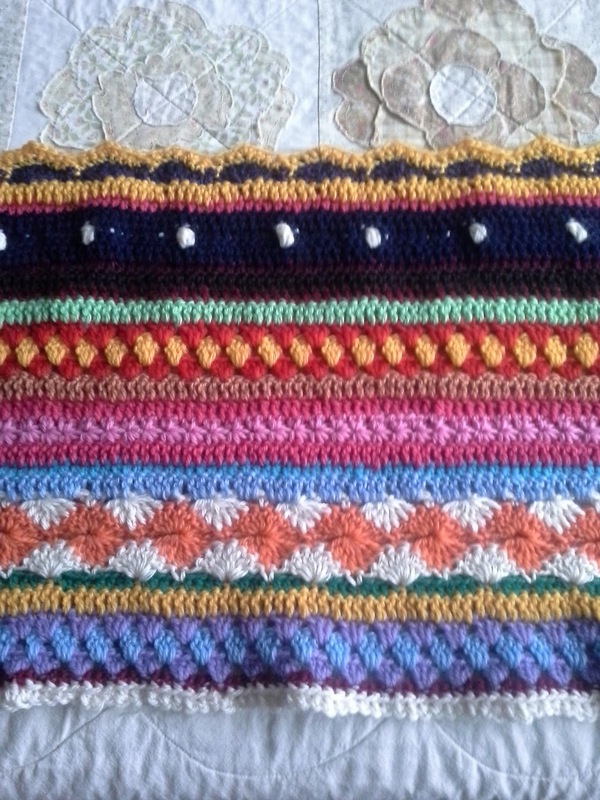 And I have to say, the colours on the model blanket are far prettier than my own. But I am enjoying the process, learning new stitches and techniques. And I'm happy to say that it's a lot easier than I thought it would be. I've kept it quite small, only 145 stitches across, more in keeping with my recent projects. I may have to revisit this one or something similar in the future, perhaps making a monster version, with a little more thought applied to colour of course. I'll take close pictures of some of the fancier stitches when we get a sunny day! It's a bit early in the morning and still quite dark here today. Right, another cuppa then I'm off to play. Oh dear, hope your sore throat gets better very soon. 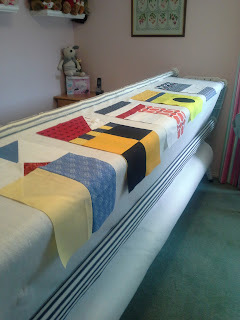 Love the flag quilt, it's going to be interesting to see it all put together. Hi Loulee hope you feel better soon,well done with your flag quilt and crochet. You take care of that throat. Best to stay home in the quiet. You don't want to share the love at work. Joe should love his quilt. I wonder how good he is at the flag alphabet? Your crochet looks fabulous. It must be fun trying out all the different stitches. I hope your throat improves soon - but it is good to see you've made great use of your time off work! Sounds like a great idea with the signal flags, I look forward to seeing the flags when it's together - something I know next to nothing about! 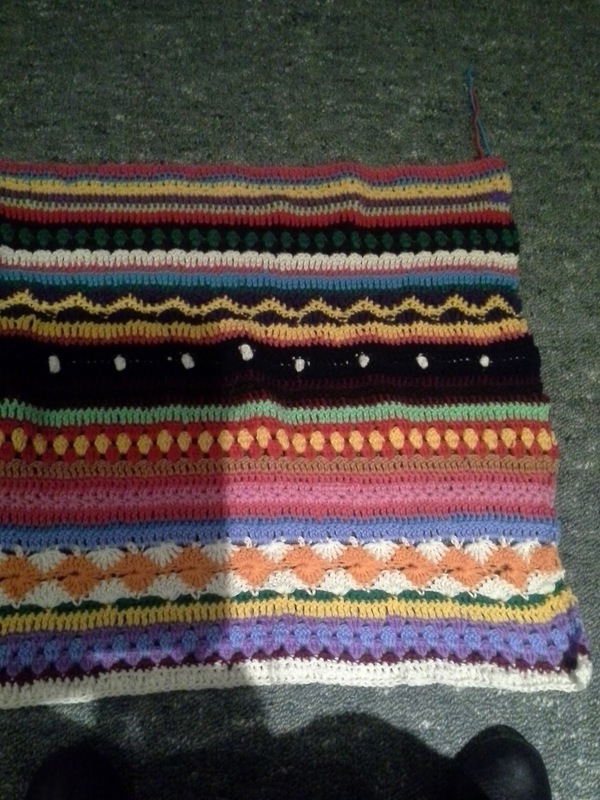 The crochet is gorgeous and looks like an interesting project.